Kaspersky Lab is one of the world’s fastest-growing cybersecurity companies and the largest to be privately-owned. Since 1997 Kaspersky Lab has been an innovator in cybersecurity and provides effective digital security solutions for large enterprises, SMBs and consumers. Kaspersky Lab operates in almost 200 countries and territories across the globe, providing protection for over 400 million users worldwide. 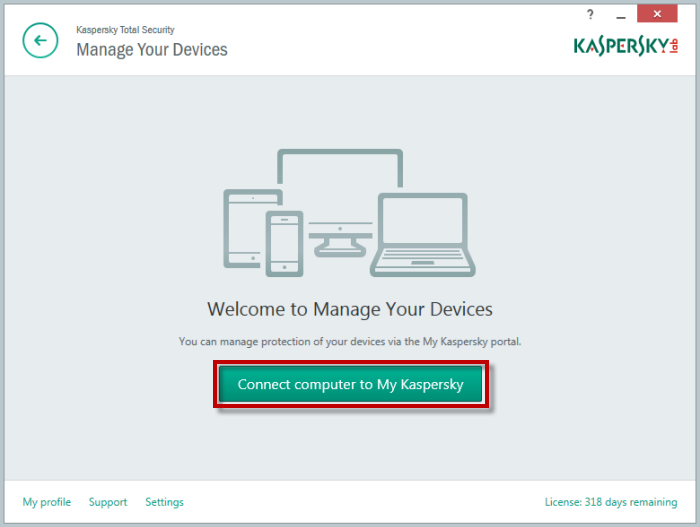 My Kaspersky is a single web-portal that allows users to view the protection status of all devices on one webpage in real-time, easily manage licenses, and gain access to additional Kaspersky Lab products, services, free tools and technical support. It can also manage the security of connected devices regardless of where they are: adjust protection settings and initiate remote scans of connected PC and Mac computers. Moreover, the new pilot feature of My Kaspersky now allows a more advanced Internet user to help other KL users (e.g. older relatives or less technical friends) to manage these security tools remotely. Via a special application available on the portal, and after the user’s consent, it gives secure remote device control to another user – for adjusting protection settings and initiating remote scans if needed. It's as simple as the web equivalent of right-click and "Access device remotely". The solution has been achieved effortlessly using the VNC SDK and VNC Cloud. The VNC SDK meant Kaspersky didn't need to worry about the complexities of screen capture, input injection, compression, TCP transport optimisation and other key design features of a responsive remote control solution. The VNC Cloud allows connections to be made without re-configuring the network at either end of the remote control session. It facilitates an extremely smooth customer experience by brokering the connection in the background, whilst remaining secure by design. We're very proud to have them as a partner. Ekaterina Samargina, Product Manager at Kaspersky Labs said: "Working with the VNC SDK has been very simple. We didn't want to re-invent the wheel with remote access and we knew that VNC is the industry and Internet standard. We were pleased to discover the availability of the VNC SDK, the simplicity of connectivity that comes with VNC Cloud and the helpful team at RealVNC in Cambridge, UK."